Get some extra working room for your laptop. 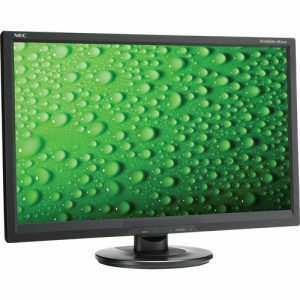 Today only, B&H Photo has the NEC 24" LED Backlit LCD Monitor Sale Priced at $84.99 with Free Shipping. Sells for $130 or more elsewhere. Tax in NJ, NY. $153 at amazon. This LED-backlit monitor has 1920 x 1080 resolution and an impressive 3-year warranty considering the price. It features arsenic free display glass, mercury free display backlighting, is Energy Star qualified but only has DVI-D and VGA connections -- no HDMI. Still a good value for general family or office use. Eco mode.